Domesticated in 9000 BCE in South Asia, Jujube fruit is a culinary go-to in Eastern cultures and those across the globe. Eaten fresh-picked as well as smoked, dried, used in sweet tea and made into juice, wine and jams, Jujubes have also gained popularity in U.S. cuisine. Jujubes are additionally known in holistic medical circles as useful in alleviating stress, and for their anti fungal, anti-bacterial, anti-ulcer, and anti-inflammatory properties. The Jujube tree grows best in half-day to full sun, and soil that is well-draining. 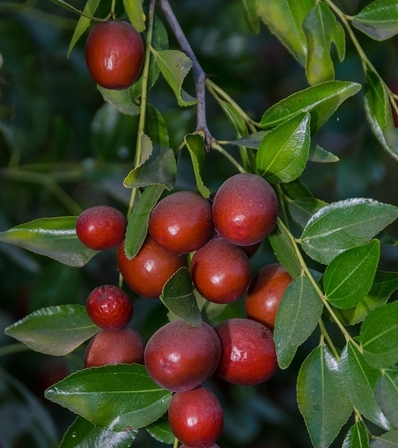 California Tropical provides Jujube trees in two varieties - Li and Sugar Cane - both of which have been proven to grow well in the climate of Southern California. The popular Li Jujube tree produces an abundance of very large, sweet, crisp and flavorful mahogany-colored fruit, which is also known as the “Chinese Date.” The size and shape of a small egg, the Li Jujube fruit also has a very small, nearly undetectable seed. The rare, fairly small Li Jujube tree features highly ornamental, contorted branches, delicate, almost lacy foliage, and a myriad of small, fragrant white flowers that bloom in mid-summer. Small to medium in size and ranging from round to elongated in shape, Sugar Cane Jujube fruit is aptly named for its extremely sweet taste. It ripens earlier in fall and features smaller plant spines than those of the Li Jujube.